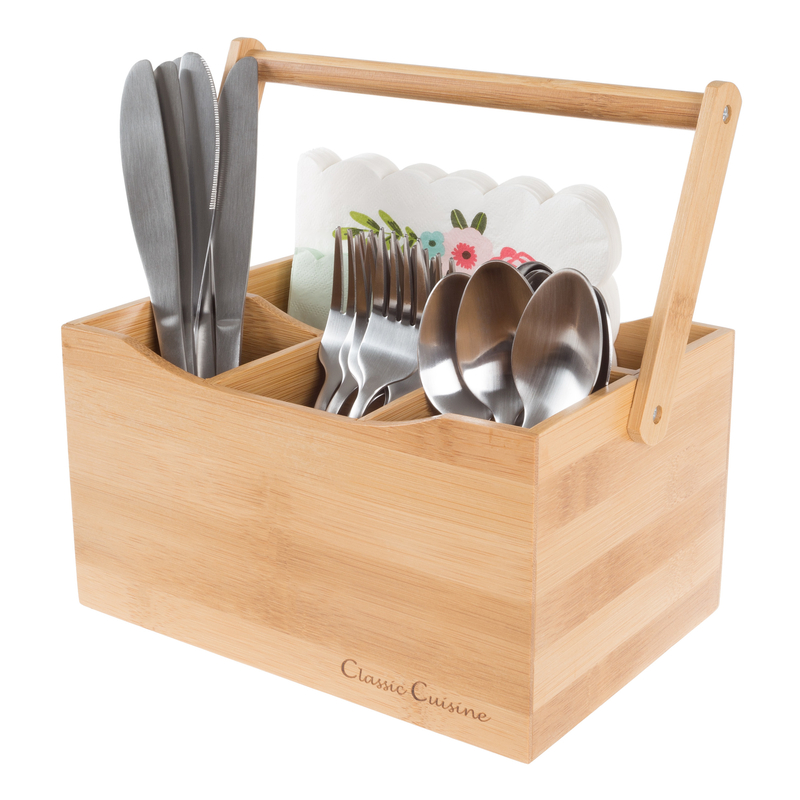 The Bamboo Flatware Caddy by Classic Cuisine is a practical and convenient way to store and transport silverware and napkins! Constructed from eco-friendly bamboo, this caddy is durable and bacteria resistant. With 3 smaller slots for tableware, and 1 larger slot for napkins or condiments, you won’t have to make multiple trips from the kitchen to the dining room or patio. The convenient carrying handle and lightweight design makes this organizer easily portable for entertaining. It’s ideal for parties, picnics, barbeques, or any occasion! Eco-friendly and anti bacterial 4 Slots: Napkins, Forks, Spoons, Knives 9 inches High with Handle Box: 4.5 x 8.5 x 6 inches Clean with damp cloth and towel dry Can be used indoors or outdoors Should not be let to stand in water Use for flatware, office supplies, craft supplies etc. Picnic Time's portable Picnic Table Sport is a compact fold-out table with bench seats for four that you can take anywhere. The legs and seats fold into the table when collapsed so the item is easy to store and transport. It has a maximum weight capacity of 250 lbs. per seat and 20 lbs. for the table. The seats are molded polypropylene with a basket weave pattern in the same color as the ABS plastic table top. The frame is aluminum alloy for durability. The Picnic Table Sport is ideal for outdoor or indoor use whenever you need an extra table and seats. It includes a hole in the center of the table to accommodate a standard sized beach umbrella (having a pole that is 1.25 in. diameter or less). Dimension - 34 x 4.25 x 15.5 in. Surface wash with damp cloth and mild soap dry thoroughly. Life's a picnic with Picnic Time! We started Picnic Time back in 1982 with a simple mission: to sell traditional European-style picnic baskets in America that everyone could afford. Since then, Picnic Time has become famous for developing innovative and practical outdoor leisure products that inspire us to spend quality time with family and friends. Over the years, our line of products has evolved far beyond the picnic basket, but one thing remains constant: our commitment to customer service. Everyone on our team is committed to your success. 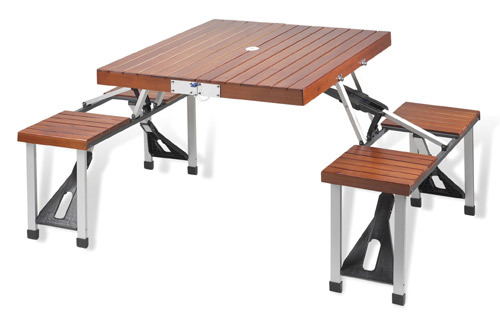 Picnic Time's portable Picnic Table is a compact fold-out table with bench seats for four that you can take anywhere. The legs and seats fold into the table when collapsed so the item is easy to store and transport. It has a maximum weight capacity of 250 lbs. per seat and 20 lbs. for the table. The seats are molded polypropylene with a basket weave pattern in the same color as the ABS plastic table top. The frame is aluminum alloy for durability. The Picnic Table is ideal for outdoor or indoor use whenever you need an extra table and seats. It includes a hole in the center of the table to accommodate a standard sized beach umbrella (having a pole that is 1.25 diameter or less). Harley-Davidson(R) Picnic Time's portable Picnic Table Sport is a compact fold-out table with bench seats for four that you can take anywhere. The legs and seats fold into the table when collapsed so the item is easy to store and transport. It has a maximum weight capacity of 250 lbs. per seat and 20 lbs. for the table. The seats are molded polypropylene with a basket weave pattern in the same color as the ABS plastic table top. The frame is aluminum alloy for durability. The Harley-Davidson(R) Picnic Table Sport is ideal for outdoor or indoor use whenever you need an extra table and seats. It includes a hole in the center of the table to accommodate a standard sized beach umbrella (having a pole that is 1.25 diameter or less). Surface wash with damp cloth and mild soap; dry thoroughly. Over two decades ago Picnic at Ascot introduced the British tradition of stylish, high quality picnic products to the USA and were an instant success. Based in southern California, the company is recognized by many as the leading designer of fashionable picnic products that combine style with function, offering exceptional value. Their extensive range includes picnic baskets, outfitted coolers, waterproof blankets, picnic tables, outdoor seating, BBQ tools, wine carriers, garden tools, and bamboo cheese sets. All Products designed by Picnic at Ascot are assembled in the USA to ensure complete customer satisfaction. They stand by their exceptional product quality with a lifetime warranty on all products. Attractive folding plastic picnic table with built in seating for four. Constructed with high strength aluminum alloy frame. Built in carry handle. Very easy set up no tools required. Sturdy & light weight. Hold up to 240 lbs. per seat.